An engraving of the island of Chios (Scio). There are two theories on how the island received it's name. The first is that the name Chios stems from "Chiona," who was the daughter of the island's ancient King Inopion. The other theory is that comes from the name "Hios," the son of Neptune, at the birth of whom, too much snow (hioni) fell on the island. Folklore contends Chios was the birthplace of the Greek poet Homer, of Hippocrates and that of Christopher Columbus in 1451. Scio is the Italian spelling for Chios. Chios was under Italian control for almost 300 years until the Ottoman Turks took the island in 1566. 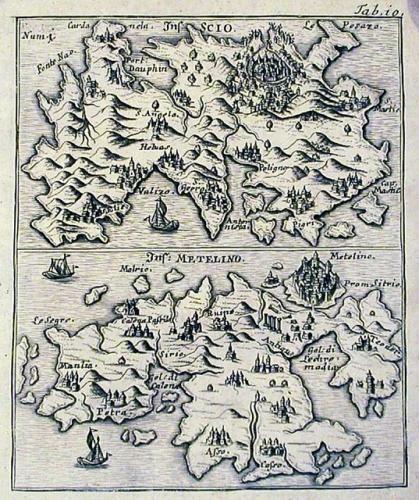 An engraving of the island of Lesvos (Lesbos, Metelino). In mythology, the island was first populated by grandchildren of Helios; Mytilene, Methymna, Issa, Antissa, Arisve, Eressos, Kydrolaos, Neandros and Leukippos. From these children the main settlements derived their names. One of the grandaughters was married to Lesvos, son of the Thessalian hero Lapithos and it was from him the island derived its name. A second theory is the word Lesvos means island with lush vegetation. From a book by A M Myller recounting his travels from 1725 to 1727. Myller journeyed from Rome to Jerusalem then on to Troy, Gallipoli and Constantinople. From Constantinople he travelled to Egypt and then to Syria. Finally from Syria he travelled to Malta and back to Rome. Scarce.